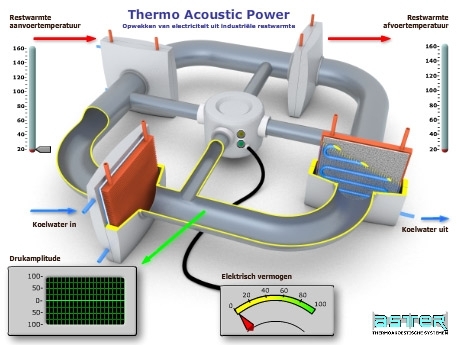 Within the framework of the THATEA project (European joint project FP7-FET) Aster has designed, build and test a multistage thermoacoustic engine for low input temperature operation. Heat is supplied and removed by the internal gas-fluid heat exchangers connected to a high and low temperature water circuit. Oscillation start when the high temperature water circuit reach 51°C and the low temperature water circuit is at 20 °C. The setup for testing this four stage traveling wave engine is shown below. At declining temperatures thermoacoustic engines become increasingly more sensitive to imperfections such as heat exchanger temperature drop, acoustic impedance matching and dissipation. Thermoacoustic power gain is proportional with the operating temperature consequently leading to less gain at abating temperatures. Because the thermoacoustic engine is a power amplifier loop power has to be increased at lower gain to maintain the same net output power. Higher loop power however will result in higher acoustic loss. Summarizing, these two effects will increase acoustic loop power (higher loss) and reduced gain and reinforce each other in a negative sense seriously degrading overall system performance at declining operating temperatures. One way to overcome this problem, and to allow for efficient operation at declining temperatures (< 200°C), is to increase the (thermo)acoustic power gain by using multiple regenerator units (regenerator clamped between two heat exchangers). This is not as straight forward as it seems because of the thermal and acoustic interaction between the regenerator units. In the common torus geometry, as for example used in the high temperature engine, a high and near real acoustic impedance, required to drive the thermodynamic cycle properly, can not be maintained in more than two regenerator units at the same time. In addition the standing wave resonator which is part of this configuration shows relatively high acoustic losses which becomes increasingly harmful at declining operating temperatures. The low temperature engine is build up from four identical regenerator units which are connected acoustically in series by near traveling wave loop sections and connected thermally in parallel. Low cost aluminum brazed louvered fin heat exchangers are used to supply and remove heat from the thermoacoustic process in the regenerator. The low temperature heat exchangers are connected to a car radiator plus fan. 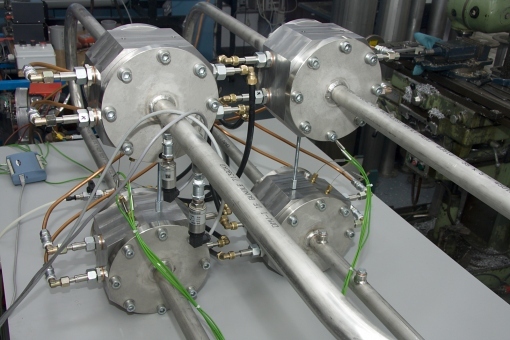 The high temperature heat exchangers are connected to a dedicated gas fired water heater to simulate a waste or solar heat source. Helium at 3.1 MPa bar is used as working fluid.